This is a book review for an occasional series on this blog. The books I’ll be reviewing are ones I think are relevant to the ideas behind the blog. You can easily find a list of the books I’ve reviewed so far by clicking on the new Books category. I don’t think James coined the term affluenza himself, because I’ve seen and heard it used by quite a few people. What he does, though, is use it as a metaphor, as if the values he’s criticising were a virus that had infected society, or rather some societies. It a device that works well, I think. In the opening paragraph of Affluenza he defines it as “placing a high value on acquiring many possessions, looking good in the eyes of others and wanting to be famous.” As James sees it, affluenza is particularly prevalent in English-speaking countries, where it tends to represent the default values of society. Affluenza is a fascinating book, well worth its length. James visited several countries to research this book. He notes levels of materialism, emotional distress (he doesn’t refer to depression as a mental illness), relationships, people’s outlooks and so on in all these countries. He then concludes, essentially, that the affluenza “virus” is far more prevalent in English-speaking countries than in others, but that it’s rising in non-English speaking countries, too. There’s plenty to like here. 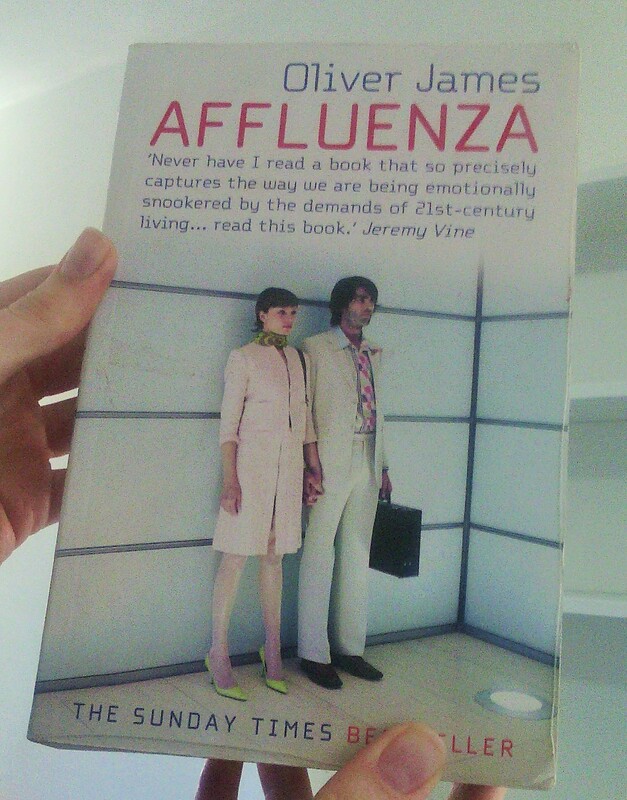 The first time I read Affluenza I was pleasantly surprised, to be honest, that although it’s by a psychologist it’s not full of vacuous positive thinking. (“Western positive psychology focuses exclusively on the successes to keep your pecker up, but that is at the expense of realising what needs to change.” YES!) Also, he doesn’t just blast the obvious stuff or lament the passing of the good old days but levels intelligent criticism at things like consumerism; and towards the end of the book he provides a list of suggestions to improve things for both individuals and societies. I think it’s brave of him to tackle issues like child-rearing, families, nursery schools and so on. That is not to say the book’s perfect. I flatter myself I know Russia better than James, and I can see that some of the conclusions he draws about Russian society are incorrect. That makes me doubt what he says about other countries, too. On the other hand, you have to be realistic: he’s only one person, and no one can be an expert on the sociology of all those different cultures. Another drawback is that the book’s tone is quite anti-American. That’s because he believes, probably quite rightly, that most affluenza worldwide is due to US influence, but that’s not the fault of individual Americans, and I don’t know how I’d feel reading this book if I were American myself. He also says that English-speaking societies attach too much importance to education and academic qualifications. Now, that is a strange opinion to hold. I’m British myself, and firms there have been lamenting for years that they can’t recruit because even university graduates have basic literacy problems. I’d say we live not in a culture that values intellectual achievement too highly but in the very opposite: a horribly anti-intellectual one. And I’m surprised by his reaction to conversations in Danish nursery schools: did he really think that nursery school employees read scientific research journals? As I’m a linguist in real life, there are also a couple of things about his use of language that I can’t let slide. He insists on referring to a particular group of addictions as aholias: for instance, if you’re a shopaholic you suffer from shopaholia. Why?! (To be read aloud in tortured voice.) This gives me the screaming abdabs. These words are based on the words alcoholic and alcoholism. Surely if you want a collective term for these addictions you could should call them the -aholisms. But why not just call them addictions? He also defines a couple of words rather strangely. For example, he illustrates the idea that beauty is more worthwhile than attractiveness by saying that we describe children as beautiful but not as, for example, gorgeous. I can’t agree: in my experience children are called gorgeous all the time, probably more often than they’re called beautiful. He plays a similar semantic trick with the words sincere and authentic, contrasting them because sincerity requires being “seen by others” to be feeling a particular emotion. Well, have you ever used the word sincere to mean that? It might sound as if I’m splitting hairs here, but it matters more than you might think because one of his key messages is that we should strive to be authentic instead of sincere, and the way he defines sincerity might well put people off those messages. Also, the book needs a good proofreader, although I realise that might be the publisher’s fault, not the author’s. However, recommending a book does not mean agreeing with everything it says. I certainly do agree with the main thrust of his argument: that many of the default values of society are shallow and unhelpful, that a lot of feminism has been hijacked by consumerism and that we need to think for ourselves about what we really want from our lives – that last one’s the point of this blog, after all. James recommends three qualities for individuals: authenticity, vivaciousness and playfulness. I think those are very good recommendations (allowing for the meanings he attaches to each of those words); I think his advice on child-rearing is timely; and I think his societal advice, while impracticable, is thought-provoking. Ultimately, that’s a good description for this book as a whole: at the very, very least, it’s extremely thought-provoking. June’s cause of the month is Changing Faces. Donate here: https://www.changingfaces.org.uk/Support-Us/Donate.